The White House staff is starting to resemble the always-changing roster of the NBA’s Cleveland Cavaliers…familiar faces are getting harder and harder to come by and the change in appointments to different positions is only causing more chaos. 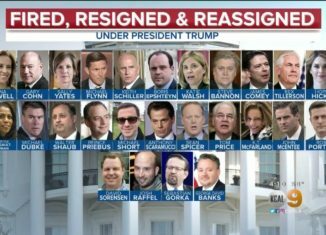 The following lists some of the most noteworthy firings and resignees under the Trump Administration, including their position and how long they lasted with Trump. Some of these government officials, like James Comey and Preet Bharara, had comfortably spent several years in their roles until President Trump came into office. Some of Trump’s appointments are breaking records for how short they last in office. Trump’s lack of discipline in his appointments of officials, including putting some family members in office, is a serious problem causing disorder in our government. Without fair justification, Trump has been trying to choose confidants and “yes men” for his selections of government officials. Trump doesn’t make wise evaluations of who he employs, with many selections being polarizing and contradicting. He often fires people for “not seeing eye to eye” with him. This is bad for our nation for a number of reasons. First, we need government officials with longevity, experience, and strong team chemistry. Arguably more important, we also need dissent; we need officials who don’t completely agree with each other. Politicians need to be allowed to criticize and oppose each other; this is what leads to discussion, compromise, and moderation. Instead, Trump is discouraging the people who normally have the ability and motivation to improve our nation. Anyone who is left in the White House will be too scared to oppose Trump if they fear that they will lose their job if they say anything to upset him. The White House needs more consistency and stability so there is less room for dishonesty, collusion, and corruption.